Personalized Wood Baby Cross - Bless This..
Personalized Baby Clothes Gift Set - Newborn..
Personalized Baby Christening & Baptism.. Premium Stylish Foam Play Mats | Cushy And..
Baby Photo Canvas Print 20x20 - Little..
Personalized First Christmas Picture Frames..
Personalized First Communion Glass Picture..
Personalized Picture Frames For Kids - Mommy..
Engraved Christening Picture Frames -..
Personalized Christening Wall Cross -..
Personalized First Communion Gifts -.. Walk With Jesus Personalized Baptism Gift..
Personalized Christening Bandana Bibs -..
With a new baby in the world, there's no limit to the types of gifts that will delight a family! Whether you choose something serviceable, whimsical, timeless, functional, sentimental, cute, or just plain celebratory, you really can't go wrong. Here are a few things to keep in mind when choosing the perfect present from a plethora of baby gift ideas. Babies have a lot of needs, so anything that tends to those needs in a tangible way - think bathing accessories, burp cloths, or diaper supplies - will be welcome baby gift ideas. Baby gift ideas that remind parents of their own childhoods are extra meaningful. Frame a cute baby photo of the new mom or dad, gift the newest edition of a favorite childhood toy, or have a quilt made with icons that represent mom and dad's lives (their home states, college mascots, or favorite hobbies, for instance). Research shows that reading to children from infancy is one of the most valuable things parents can do, so help get baby's library started with a few board books. Try a mix of beloved old titles and recent works - there are new classics written every year! New parents spend a lot of time in the house - but babies are portable, and a membership to a local museum, zoo, or play space (anywhere that kids are welcome) can be just the inspiration they need to get out and enjoy family time. People think long and hard before choosing a name, and any baby gift ideas with those significant new initials on them feel thoughtful and unique. Considering a towel set, special onesie, or baby bag? Emblazon it with a moogram or the baby's full name. New babies don't start playing with complicated toys right away, but a plush pal is appealing from day one. Choose a high-quality, extra-fluffy stuffed animal to add to the friendly faces in baby's room. Moms and Dads have needs too, but there's no time to tend to them with a newborn around! That's why gifting a week of premade meals, scouting extra-luxurious bubble bath, or showing up with a bottle of nice champagne to celebrate will always be welcome. Cheers! One day you’re waiting to hear news, and refreshing your Facebook page for any signs of an announcement. The next thing you know, a simple update brings a new life into your world. Now you’re tasked with scouting gifts to celebrate that sweet baby. 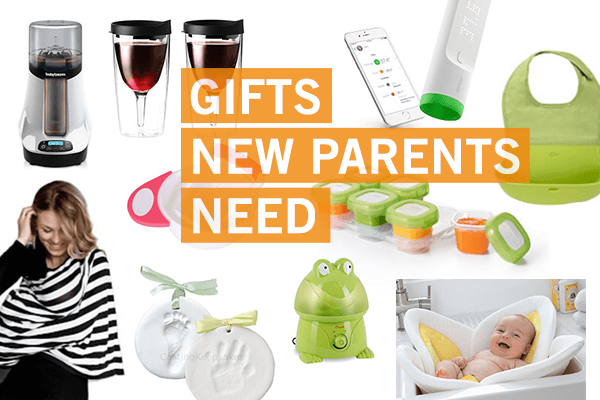 We’ve got you covered, so boomark this guide to special gifts for a baby. That way you can spend less time shopping — and more time soaking up that newborn.